With the perfect blend of storytelling, animation, and music this is one movie (Shrek) the whole family can enjoy. He's big, green, ugly and lives in a swamp. In 2001, we fell in love with him so much that we ended up with three sequels and a Broadway musical. 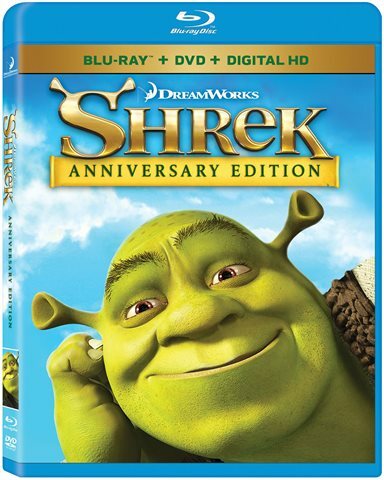 He is forever engrained in a generation's mind, and now Dreamworks has decided to release the movie that started it all on Blu-ray as the anniversary edition of Shrek. Shrek (Mike Myers; Wayne's World) is an ogre living his seemingly content life in his swamp until Lord Farquaad (John Lithgow; 3rd Rock from the Sun) decides all the woodland creatures needed to be relocated. When they invade the swamp, Shrek makes a deal with Farquaad to restore his peace and quiet. If Shrek delivers the princess, Fiona (Cameron Diaz; There's Something about Mary), to him he will clear out the swamp. Fiona is a beautiful princess with a dark secret who is living tucked away in a tower. The only thing Shrek and his new sidekick, Donkey (Eddie Murphy; Beverly Hills Cop) need to do is fight the fierce, fire breathing dragon, rescue Fiona and deliver her to Farquaad. What they don't know is that Fiona is cursed and turns into an ogre each evening. As she and Shrek fall in love, the arrangement becomes more complicated. An animated film for the new millennium, Shrek became a powerful, successful franchise and the first film is the reason why. It is a good story with a twist and memorable characters. It has a solid script and a fun soundtrack. It's a funny adventure and a love story all rolled into one, which makes it appeal to a variety of individuals. The cast is terrific with Myers displaying his talent for impersonations as he evokes a Scottish Brogue to a tee. Diaz and Lithgow are both fantastic and blend well with the rest of the talented cast. The real star however is Murphy. Donkey is probably one of his best characters and some of his finest comedy work. I think Donkey will remain beloved as quirky, self-deprecating and funny long after some of his other feature film roles are forgotten. The Blu-ray only offers a few new extras – The Animators corner and Shrek's Interactive Journey can be missed unless you are a young aspiring animator at heart. The Karaoke dance party is cute and the secrets of Shrek add a little insight into the film. The best extra by far is, no surprise, Spotlight on Donkey – that lovable character we can't seem to get enough of. Presented in 1080p High Definition video, the quality is very good and doesn't showcase any lack of sharpness, even though the film was animated over 16 years ago. The 7.1 Dolby audiois excellent and the audio mix is well done. The music is enhanced by the quality of the Blu-ray. With the perfect blend of storytelling, animation, and music this is one movie the whole family can enjoy. Depending on one's age, there are different aspects that will appeal to the individual viewer, but it's a film that is a crowd pleaser on "family movie nights". It's also a movie that has aged well and is ready to be explored by a whole new generation. This anniversary edition (though they don't say which- 15 years if you are keeping count) is one that should be in almost every home. It's worth buying and watching over and over again. Download Shrek Anniversary Edition from the iTunes Store in Digial HD. For more information about Shrek visit the FlickDirect Movie Database.